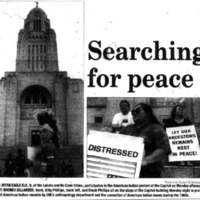 Headline "Searching for Peace" associated with two images with an American Indian protest at the Nebraska State Capitol in 1998. To inquire about usage, please contact Archives & Special Collections, University of Nebraska-Lincoln Libraries. These images are for educational use only. Not all images are available for publication. Sandy Summers, Daily Nebraskan, “Photographs, Daily Nebraskan,” Nebraska U, accessed April 25, 2019, http://unlhistory.unl.edu/items/show/1967.